French Emblems: Emblem: Principis calamitas, privatorum dissimilis. A disaster for a prince is different from a private citizen’s. Quas rapido Boreas decussit asper turbine. Imperium Nemesis, tuetur is gentis decus. The oak tree stands, devoid of its joyful ornament of foliage, Which the harsh North Wind has shaken off in a fast-blowing gale. A prince, though savage Nemesis has stripped him of his ancestral power, still protects the honour of his family. Scribere versiculos, amore percussum gravi. Ponticam pinum, & Sylvae nobilis filiam nominet. The metre is an Iambic trimeter, to which is added an Archilochian, like the lines of Horace in the Epodes: “It is no use me [or I take no pleasure in] writing my little verses, as before, in bearing my punishment, when I am smitten with the pains of love”. I shall depict an oak tree, supported by rather solid wood, and strong roots. Such is the position of Princes, more robust than that of private citizens. Looming over it from one side will be the head of a man appearing from out of a black and stormy sky, [p.116] blowing with puffed-out cheeks (for so the ancients drew the winds), and stripping its leaves, some of which are seen lying on the ground, even though they are green, and some are falling, with a few still surviving on one or another branch; and on a banner encircling its trunk will be written that Italian phrase: ‘basta ch’io vivo’ [it is enough that I am alive]. 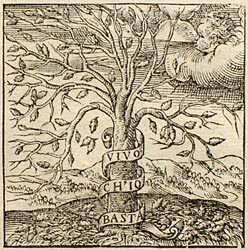 It is nothing to be amazed at, and truly not ridiculous, to compare a Great Man to a tree, seeing as Horace himself speaks allegorically of Pompey the Great, a man most famous equally for the number and for the consequence of his deeds, referring to him as a Pontic pine, and an offshoot of the noble Forest. The poet Lucan, with the same thought, compares the same Pompey to an oak, surrounded by a forest of trees. A prince, even if he is driven from the heights by the dreadful mockery of harsh fortune, nevertheless does not suffer his magnanimous spirits to be so bruised or destroyed for the sport of blind fate that any dishonour should be allowed to the noble lineage of his ancestors. Gilimer, king of the Vandals, was a man of this stripe (as Procopius records); but our own age has not produced one such. The same emblem is suitable for a strong man of unbowed heart, who has been stripped of rank and wealth through the whisperings of envious men, but is content to retire into a subsistent private life. 1. Horace, Epodes 11.1-2 (except that the first word should be Petti or Pecti). 2. Odes 1.14.11-12. ‘Pontic’ refers to the region around the Black Sea coast of Asia Minor. 3. Gilimer ruled in North Africa, from 531 to 533, but was crushed and run out by the Byzantines under Belisarius (Battle of Ticameron). He was the last king of the Vandals.